Inicio » Travel » How to visit Mecca? 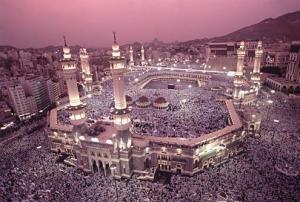 For Islam, Mecca is the main place of all its religious thought. According to their traditions, in this city was born prophet Muhammad, so every year is is visited by millions of Islamists coming from different parts of the world. In this city, there is a good amount of important religious monuments for this religion. One of the most important is mosque Masjid al-Haram, in this place, according to Islamists, es el punto en el cual el cielo se toca con la tierra. This temple as a cube-shape construction. In this article, apart from making reference to some important sport regarding the meaning and importance of Mecca, we will also talk about how to visit Mecca in case of not being a believer. For the followers of this religion, Mecca is a place of great importance, so every Islamist has to visit it at least once in his lifetime and the majority does it during the Hajj. Owing to the fact that this religion is extremely hermetic, it is very difficult for the non followers of it to enter these pilgrimage places. One of the best ways of how visiting Mecca if you are not a believer, is to apply for a special visit visa. This application has to be done with a representative or believer, who will be in charge of you during your stay. This representative has to be Saudi Arabian or an expatriate and the application for this document will be done from inside the city. In case of the visa being approved, the required documents will be sent to the Saudi Arabia Embassy in your country. As you may have seen, visiting this holy city is not easy at all and much worse if you are a woman since this religion is extremely strict regarding women’s the dress code and behaviour. In case of going, they will have to remin in company of their representative in front of the community. However, in order not to leave you in suspense about the different monuments there, we will talk about them. As we saw before, in Mecca we can find Masjid al-Haram mosque. This is the biggest mosque in the world, and it was built in 1570 and in its center it is Kaaba. Also known as ‘The House of God’, the Kaaba is a cube-shape building in which a meteorite piece wrapped in black fabric and embroidered with gold threads is kept. This is the central point of their religion since it is said it was built by Abraham and his son Ishmael and it is the place towards which all muslims turn and look at to pray five times a day. As a curious fact about Kaaba, when muslims to to this mosque they have to walk towards the left and complete seven turns around it and try to touch a corner of this black stone. This ritual is known as the Tawaf and it is done to show unity in front of the unique God. So now you know how to visit Mecca and the most important places for the believers of this religion. In case of not being a believer and having the unique chance of visiting this emblematic city, you have to show great respect towards the customs and traditions of these people when visiting this pilgrimate places since, as you may have seen, everything you do is going to be supervised by your representative in front of that community and it is important to show yourself eager to learn everything they can teach you.